Recently, I witnessed for the second time a demonstration by the Landless Worker’s Movement (Movimento dos Trabalhadores Sem Terra, or MST). As I watched and filmed the demonstration, I could not help wondering about the complex play of relations that unite and oppose people that still exist in Brazil left over from its period of colonial rule. I wondered about the differences between those people that continue to hold on to sovereignty and rule and those fighting to attain some simulacrum of decent living conditions. Clearly, these differences are born of colonial history – that is, the history of aristocrats keeping puppet administrators in their pay, creating a native bourgeoisie, and fashioning classes of peoples beaten down, undernourished, sick and terrified for the sole purpose of exploitation and profit-taking. After a bit of research, I discovered that the history of land reform in Brazil is a convoluted clash of ideologies, domestic policies and long-held social practices. In addition, the basis for MST’s continuing struggle is the “social interest” principle. That is, it claims that its land occupations are legally justified by Constitutional law interpreting a statute that land property should fulfill a social function. Nevertheless, more important, they struggle against pre-modern, old regime property politics that disfranchises the rural poor in a country twice the size of Europe where only 3% of the population controls over 70% of the arable land. Apparently, the first statute concerning landed property stems from the Landed Property Act (Lei de Terra) of 1850 that was drafted during the transition from colonial rule by Portugal to a nationally independent Brazilian state. This law established that the standard for acquiring land would be by money purchase directly from the State or previous owners. However, this law did not take into account the already mammoth landholdings by means of royal family land grants to well-placed people that assisted in creating a rural bourgeoisie and strongly limited small planters and peasants access to land for subsistence agriculture and small-scale farming – or perhaps it did take this into account. At any rate, this property structure led to violent conflicts as evidenced by the Canudos War (…a settlement of 30,000 poor people that were brutally massacred by the Brazilian Army) and the Contestado War (…a war that lasted from 1912-1916 claiming over 8,000 lives) of the late 19th and early 20th centuries. These conflicts were mostly the result of the local and federal governments being pressured by landowners to take action against the settlements because of labor shortages caused by migration. 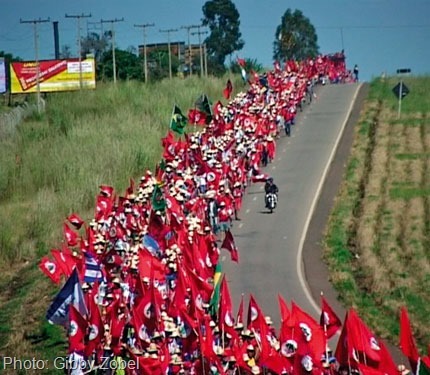 In addition, there was a series of conflicts of peasant resistance to evictions by powerful and politically well-connected ranchers such as Teófilo Otoni, Minas Gerais, in 1948; Porecatu, Paraná, in 1951; South-West Paraná, in 1957; Trombas, Goiás, 1952–1958. At this time, there was no national “ideology” yet calling for a reform to landed property laws in Brazil. Later attempts, however, starting in the 1960s, with the organization of peasant leagues opposed to the eviction of peasants from rented plots and the transformation of land into grazing for cattle were directed by the tendency to oppose existing landed property structures. 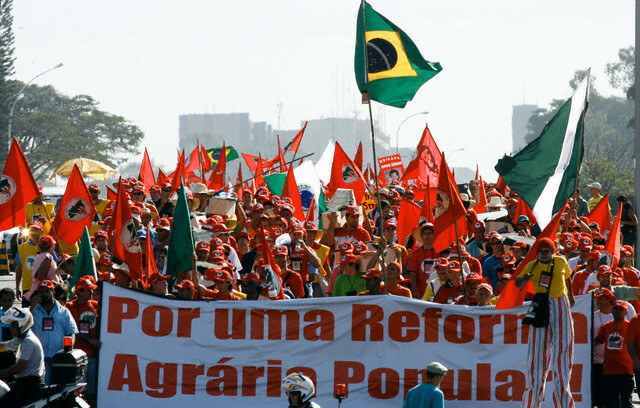 As such, the fundamental philosophy of MST’s opposition is that the development of a capitalist Brazilian agribusiness, highly dynamic and economically well developed was at the expense of social exclusion of the rural poor and that landed property rights favored a single class – the rural bourgeoisie. Much of the driving force behind MST organizing comes from social doctrine of the Catholic Church that property should serve a social function. This principle was first made into official Catholic doctrine by Pope Leo XIII’s Rerum Novarum encyclical and evoked during the eve of the 1964 military coup by President João Goulart in his famous “Central Rally” held in Rio de Janeiro, It was believed that the military dictatorship wanted to use land reform as a platform to develop conservative small farmers as a buffer between latifundio (privately-owed, mammoth sized farms; for example, one could enter the front gate of a farm in New York City, and not arrive at the main house until reaching Boston, Massachusetts) and rural farmers. Again, this principle would be upheld by the Brazilian Catholic hierarchy in 1980 at the conference of Brazilian Bishops in a document entitled “Church and Land Problems” imploring the need for acknowledgement of communal rights to lands. Still further, the revised 1988 Brazilian Constitution requires that land serve a social function and mandates the Brazilian government to expropriate land for the purpose of agrarian reform of rural property that is not performing its social function. The method that MST chooses to use in its struggle for land reform is identifying what it believes is unproductive rural land that does not serve its social function, occupying it through a series of massive and continuous occupations, and then moving to petition for the legality of their occupation. The MST is not a political party and has no leadership other than a basic organizing unit, public interest attorneys, human rights and civil affiliations, elected representatives and a series or organized grassroots units. It is for all intent purposes a decentralized organizational model dictated by the need to avoid clear-cut leadership that could be bribed or assassinated. Although in most cases, Brazilian courts tend to uphold the rights of landowners and charge MST members with violations of law, the MST has been successful in acquiring land for 377,000 families: taught over 50,000 landless workers to read and write; has started its own school – Florestan Fernandes School (FFS); educated over 150,000 children enrolled in over 1,200 primary and secondary schools; employs over 3,800 teachers; trained over 1,200 educators and conducts classes for over 25,000 young people and adults. It has successful set up partnerships with international organizations such as UNICEF and UNESCO as well as the Catholic Church and is represented by over 475,000 families from 25 states throughout Brazil. In addition, it has set up agreements with seven institutions of higher learning to provide degree training for MST teachers. Without doubt, the MST is the most dynamic, best organized, and effective social movement in the history of the country. Finally, the looming question that continued to swirl in my mind as I watched the orderly marchers pass by was what is the real purpose of being a native of a country if you have no place to live? And in each country, is it not the preamble of citizenship and the stipulation for access to social processes the requirement of a legal residence? Here then lies a naked contradiction, shorn of its trappings. Landless Workers Movement. Available:http://en.wikipedia.org/wiki/Landless_Workers’_Movement; We are Millions. Available: http://newint.org/features/special/2009/12/01/we-are-millions; Wolford, W. (2003). Families, Fields, and Fighting for Land: the Spatial Dynamics of Contention in Rural Brazil. Mobilization: An International Journal, 8(2), 201-215. War of Canudos. Available: http://en.wikipedia.org/wiki/Canudos); Contestado War. Available: http://en.wikipedia.org/wiki/Contestado_War) Photo: Courtesy of Gibby Zobel. greetings, do you folks have reblog option for the site? Yes, at the bottom of each page, you should see several social media buttons. Locate the “Reblog” button in order to share with any other social media site of your choosing. Thanks for reading Perspectives…tchau. thanks for the reply, i’m here thru wordpress and for whatever reason there is no reblog button available. Go to the home page and choose the article you are interested in reading. Click the “continue reading” link – it will take you to the entire article. At the bottom of the page, along with the different social media buttons, you should see a “reblog” button. Just click it and decide where you want to share the article. Contact me if you are still having problems. Thanks…tchau.